Again a moment to be glad, here comes yet another inspiring article for our IU e-magazine readers, about Mr. Lakhmichand Khilani who was born at Sukkur (Sindh) situated on the banks of river Sindhu. He was a voracious reader from childhood. Soon he began writing poetry which was, of course, by a child for children. His writings are rooted in the contemporary society and portrayed the erosion of traditional values and abandonment of cultural heritage by upper middle and neo-rich class, fast emerging in the process of globalization and onslaught of consumer culture. His works are a scathing attack on the mammon worshiping of present-day generation who may know the cost of everything but value of nothing. His writings have been translated into many languages as well. Apart from his work as an activist and a creative writer he has been editing and publishing a literary quarterly by name 'Rachna' for past 34 years. 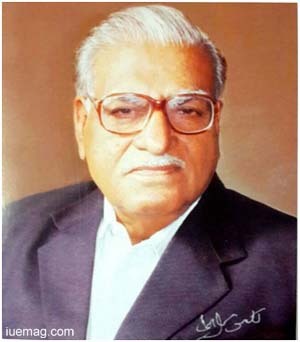 He, along with some like-minded friends, has established Indian Institute of Sindhology at Adipur (Kutch), the place he is convinced, is a natural soil for Sindhi language. This 79 year old poet and much more, doesn't feel old at all, and he was so eager to convey his life's story that he didn't wait a single day to give the interview. We met and here is what I have got for you, readers! Sir, I have already done your introduction but how would you like to be presented to our readers? I may be old enough for my age, but I say that I am growing each day; I get to learn new things every day. And just like you, I too live each day with a hope for betterment; betterment of people, this city, my students and, most importantly, betterment of self. Presently, I am the Hon. Director of Indian Institute of Sindhology (Bharati Sindhu Vidhyapeeth). As we know you were born in Pakistan before the partition, so how was life there? I was just 12 years old when India and Pakistan were separated. My father was a big Zameendaar and so money was never a matter to worry for us. As a child, I was never guided about what studies would bring to us in future but we did study. And today, when I see my students at school, I feel as young as them and sometimes I do see myself in them. The time has changed a lot, things are different, people now understand the value of studies and I am glad to see this change in our nation. How did you come to India and were you given a choice to stay at Sindh? I clearly remember that it was summer and I told my dad to take me to Haridwar. It's a holy place. Along with my family I went to Haridwar for holidays but partition happened in the same year and we couldn't return back. We had to settle down in the new India. Initially, we settled in Banaras and then, soon moved to Calcutta (now Kolkata). How did you take up civil engineering as your career? We were new to Calcutta, and it was time for me to take admission in a school but my dad had a friend who had his own business of apparels. So, I was sent there to be trained as a salesman. I worked there for 4 months, but then I was called back and admitted to a school. It was time to decide my career. So, I did my graduation in Civil Engineering from Banaras Hindu University and then joined a Civil Engineering firm in Calcutta. Which were your earlier works published in India? In India, my first story was published in 1960 in Sindhu Dhara. This story was inspired by a real life incident when I was approached by a teenage girl to read a letter written in Sindhi by her parents. Which are the books that you've penned till date? There are in all 23 books in various literary genres. 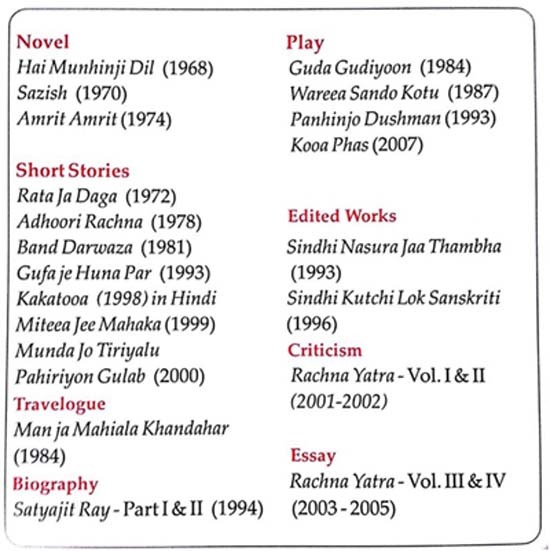 They include seven collections of short stories, three novels, a biography of Satyajit Ray, and translation into Sindhi of three prestigious Bengali novels by Baneck Bandhopadhyay, Bimal Karr, and Panther Panchali of Bhibhuti Bhushan, four full length plays apart from a travelogue, and four volumes of essays titled Rachna Yatra. Please tell us about the awards and titles earned by you. He smiles and says: The biggest award that I have achieved is "Self Satisfaction". These awards do give us happiness which is temporary but the contentment of our heart is eternal happiness. A few lines in which you would like to sum up your life. "The train is leaving the platform and its speed is accelerating. I have failed to board this train and am running fast and faster to catch the running train. As I continue to run along the moving train the platform goes on stretching." Thank you so much Mr. Lakhmi Khilani! I appreciate your efforts for imparting your experience to the youth of this world through our IU e-magazine. Thank you for these precious words. I am sure you'll inspire many more with your 79 years' journey. Any facts, figures or references stated here are made by the author & don't reflect the endorsement of iU at all times unless otherwise drafted by official staff at iU. This article was first published here on 10th July 2014.